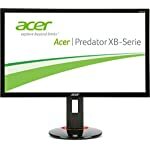 The Acer Predator XB281HK is a top of the range gaming monitor for those looking to build the ultimate gaming rig. This is the kind of beast you’d pair up with a top of the line graphics card, or two. It’s a 4K screen, limited to 60hz (not unexpected at this resolution! ), and features G-Sync technology (so you’ll want to be running with a Nvidia GPU) backed by TN panel technology. 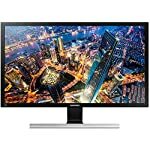 The question buyers will need to ask themselves is whether they prefer a crisp 4K screen running at 60hz or would you rather be running an IPS monitor at 165hz, at a lower, but still very respectable, QHD resolution. If this is preferable then you’ll want to look at the 27″ XB271HK. The IPS panel will give you a better image quality and 165hz looks very smooth! The XB281HK is the newer version of the XB280HK. If you are wondering what the difference is between the older Acer XB280HK vs XB281HK then I’m not sure I can help you as on paper they both seem to have the same specs. If you are aware of any key differences then please do let us know in the comments. Suffice to say moving to the newer model is not an upgrade you’d consider if you have the old one, however, if you are looking to move to 4K then do read on, it’s the XB281HK that you are likely to find available in the shops. You can instantly tell this is a “gamer” monitor the moment you set eyes on it. It’s one of those screens designed for a teenage boys bedroom – complete with sharp edges and go faster red stripes. Personally this puts me off a little, it wouldn’t really go in my home office but perhaps I am no longer the target audience of this type of screen (even if I do consider myself a gamer!). The stand itself is sturdy and fully adjustable, as I’d expect from a premium monitor in this price range. You can easily change the height, tilt, swivel and pivot without having to wrestle against hard to move parts. The base is actually fairly wide though which is not ideal if you are tight for desk space. The specs do list a VESA mounting attachment which will quickly solve that problem. Connectivity is well handled with head phone sockets, USB ports and video connections via HDMI or DisplayPort. Let’s be clear, running a 4K screen requires a decent gaming rig at the time of writing. Perhaps you are reading this in a couple of years time when the mid range cards are capable of cranking out 3840 x 2160 images at 60 frames per second but right now you’ll need a top of the range card or two to maintain that frame rate. That said, this monitor does have G-Sync technology installed which is designed to keep the animation smooth and tear free when your rig does drop below the ideal frame rate. And monitors are the one piece of PC kit that tend to hang around the longest so investing with the long term in mind isn’t a bad idea. If you can’t maximise it now, you will in the future. The XB281HK features a TN panel, and whilst this technology offers decent colour accuracy and fast response times the image quality suffers as soon as you move away from looking at the screen dead on. Most people can live with this but when IPS based monitors are getting faster and more affordable you start to wonder if the sacrifice is worth it. We give the Acer Predator XB281HK a 4.5 out of 5 rating. Want to know what existing owners of the monitor think? You can read real user reviews here. 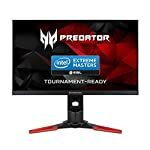 Should I buy the Acer Predator XB281HK? The XB281HK is a 4K game orientated monitor that will appeal to anyone wanting to make the jump to high resolution gaming. You might want weigh up the pros and cons of lower res but higher frame rate models such as the XB271HK. The latter model's fast refresh rate may be preferred by fast paced twitch gamers. If you are having some doubts about this purchase then why not read some real owner reviews and see what other buyers think. Welcome to the Acer Predator XB281HK FAQ. This section attempts to answer common questions you may have, please get in touch if you have any more queries or if you think our answers need updating. Whats the difference between XB280HK and the XB281HK? As far as I can tell the spec list is the same, they are both 4K, G-Sync 60hz monitors. 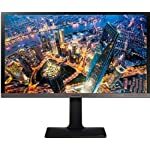 Can I run a 4K monitor with my GTX 960? I would not recommend this. You’ll need a video card with plenty of RAM and a lot of GPU power to move all those pixels around. This level card is just not suitable. You’ll need a modern top range card, something like the GTX 1080 will be ideal. If you are looking to upgrade in the future, you can run monitors at a lower resolution to get better frame rates, just be aware that the image might not be as crisp as a native screen. 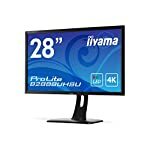 Should I Buy a 4K Monitor for Gaming?